ST. PETERSBURG, Fla. -- Minor League Baseball™ and the Topps Company announced today that Rochester first baseman Chris Colabello, who led all Minor League Baseball full season players with a .352 batting average, and Reno shortstop Chris Owings, who finished in the top 10 in batting average, hits and runs, are among the honorees selected as a league Topps Player of the Year in the annual George M. Trautman Awards. The Baltimore Orioles led all Major League Baseball organizations with three farmhands selected, while the Twins, Diamondbacks, Mets and Giants each had two honorees. A total of 10 MLB organizations are represented in all. 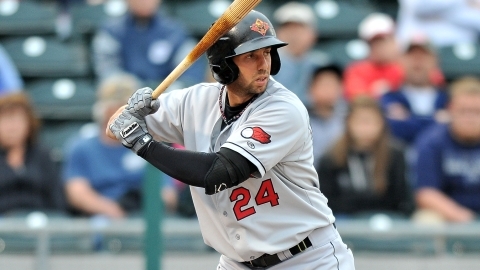 In addition to leading the International League in batting, Colabello also finished first in slugging percentage and on-base percentage and tied for fourth with 76 RBIs. He was chosen as the IL's Most Valuable Player and Rookie of the Year. Outfielder Adam Brett Walker II of the Cedar Rapids Kernels (Midwest) is the other player from the Minnesota organization who was selected. Owings paced the Pacific Coast League in hits (180) and runs (104). His .330 batting average was good for second place in the PCL, only one point shy of the league leader. Like Colabello, Owings took home his league's Most Valuable Player and Rookie of the Year awards. Mobile right-hander Archie Bradley (Southern) is the other Arizona farmhand honored. The three winners from the Baltimore organization are Bowie catcher Caleb Joseph (Eastern), Frederick catcher Michael Ohlman (Carolina) and Aberdeen first baseman Trey Mancini (New York-Penn). The San Francisco Giants honorees are a pair of shortstops, Christian Arroyo of the Arizona League Giants and Jeremy Sy of the Salem-Keizer Volcanoes (Northwest). Pitchers Chris Flexen of the Kingsport Mets (Appalachian) and Gabriel Ynoa of the Savannah Sand Gnats (South Atlantic) are the two farmhands from the Mets system who were selected as their league's best player. Topps acknowledges the top performers throughout Minor League Baseball, including monthly awards and All-Star teams in each classification.